Aly Martinez is the USA Today bestselling author of the On the Ropes series, the Wrecked and Ruined series, and the Retrieval Duet, among other books. Originally from Savannah, Georgia, Aly now lives in South Carolina with her four young children. Visit her at alymartinez.com. 5.0 out of 5 starsHeart stopping!!!! Jaw dropping, unpredictable and addictive! THE DARKEST SUNRISE has left me with the biggest book hangover, as I patiently wait for what I know will be a stunning conclusion!!! O.M.G!!! Hands down, this is one of Aly Martinez's best stories to date - I am in awe of her ability to write such a heartbreaking yet spellbinding story with characters that I fell head over heels in love with!! I love Ms. Martinez's writing - she has an innate ability to draw you in from the very first page, and keeps you captivated right till the end!! Both Charlotte and Porter have such tragic pasts and are only a shell of their former selves yet together they survive through the darkness that has blanketed their lives. Their attraction and pull goes beyond the physical; they share this unbreakable bond that no one else can begin to understand. Despite the angst and heartbreaking feel of this story, Ms. Martinez delivers some very funny and awkward moments between Charlotte and Porter!! Their text message exchange had me in fits of laughter, and yet their back stories had me in tears!!! In a nutshell, this was an emotionally gripping book that will leave you needing the conclusion like your next breath!!!!! I very rarely give out 5 star reviews, but this book really deserves it! I can't wait for the 2nd part. This story is so real, so moving, it will definitely be in the top 5 books of 2017. I hate cliff hangers, but I need time to re-read and be ready emotionally for book 2 of this truly moving duet. It is easy to pull at reader’s heart strings with sensitive topics such as missing child, child with medical issues, suicide, grief whilst surviving in the modern day world. Here we meet Dr Charotte and Porter. Read as dual point of view, this story happens around the same time as the book “Across the Horizon” so there are some overlaps to the other characters Tanner and Rita. Porter is persistent in getting Charlotte to date him could of been less forced as this story is about them. Over the course of a year, Charlotte Mills' life had gone through a series of upheavals, each encapsulated in just a few words. For ten years she lived in that darkness. Offering fake smiles, fake everything to those around her because that's all she had to offer as she finished her medical training and then deliberately immersed herself in her work. Single father Porter Reese sought her out as the best specialist he could find for his own ailing son, but when they met he found a woman whose darkness mirrored his own. Don't they say"Misery loves company"? 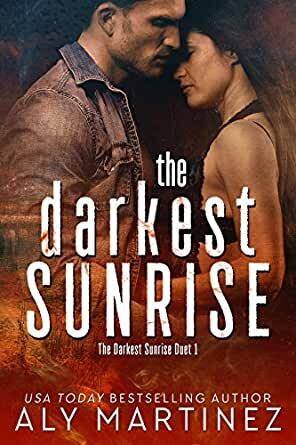 The Darkest Sunrise was, for me, an intensely emotional read. Aly Martinez paints a thoroughly believable tableau where the ever prevalent darkness is contrasted against highlights filled with vibrant colour as Charlotte and Porter together bring each other to life in ways neither has experienced in years. Going deeper into the story reveals how the darkness each experiences differs, exposing that what was thought to be darkness was more accurately muted, where the variations in texture and tone are so subtle that they're not readily apparent. The ongoing tragedies that the two main characters, and those they're close to were living through had me close to tears time and again while the aridly dry humor they share when they choose to sit in their respective darknesses together had me actually laughing out loud. The writing was such that I couldn't help but experience alongside them every feeling and emotion. Despair, hate, hope, betrayal, love and loss. It wrecked me in the best way. Told first person from more than just two perspectives this first book in the Darkest Sunrise duet sucked me in completely and likely won't let me go even when I'm done with book two. 5.0 out of 5 starsBeautiful! Heartbreaking! Amusing! Enthralling! A Unique story that I will never forget! Beautiful! Heartbreaking! Amusing! Enthralling! A Unique story that I will never forget! Aly Martinez has a way of making us "Feel" through her words and The Darkest Sunrise brings out emotion after emotion in every page. It's a captivating story of two broken people who understand one another like no one else can. The romance between Porter and Charlotte is sweet and funny despite the emotional turmoil. I did get choked up quite a few times with the heartrending pain that Porter and Charlotte are in but I did laugh quite a few times with the antics between some of the characters in the book and I smiled ALOT at the love developing between Porter and Charlotte. A must read for anyone who loves a beautifully written story that makes you feel. I can't wait for more.